This story is the sixth installment of Moment’s series on Israel’s Arab citizens. Struggles over land & identity are at the heart of growing tensions between the Israeli government & its once-nomadic citizens. Riad Abu-Quian drives his late-model Mazda over an unpaved road and through a treacherously steep gully to reach Umm al-Hiran. Some 700 people, about 150 of them children, live in the village, which clings to the slopes of a rocky hill in Israel’s southern Negev desert. To an outsider, it appears to be a jumbled collection of shacks and roughly built houses with solar panels and satellite dishes haphazardly attached. But to Riad and other Bedouin members of the al-Quian tribe who have lived here all or most of their lives, it is home. A tall, lanky man of 40, Riad wears a snug-fitting black button-down shirt, dark jeans and a cap tipped jauntily to one side. He makes his way to his compound, which consists of three small, single-story, flat-roofed houses, perched near the top of the hill. One house is for his mother, who is one of his father’s numerous wives, and the second is for Riad’s first wife and the couple’s three children. He lives in the third with his second wife, Maryam, 32, and their two children, ages 10 months and three years. Riad and Maryam, both graduates of the Middle East Studies program at Ben-Gurion University of the Negev, have taken great pains to make their crowded three-room home comfortable. Wood paneling is glued to the walls and ceilings to cover the concrete, and curtains hide ill-fitting windows. Toys and books are crammed into shelves, and two cream-colored faux-leather sofas face a flat-screen TV, filling up the living room. That is because Umm al-Hiran is one of nearly 50 Bedouin villages that the Israeli government regards as illegal. These “unrecognized villages,” as they are commonly called, are literally off the official map—not even visible on most GPS navigation systems. Since they were built without official permission, any structures within them can be legally demolished. 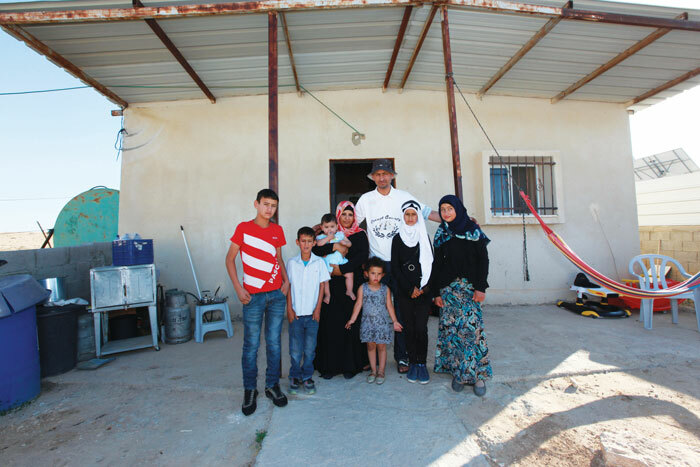 As a result, almost every house in every unrecognized village has been served with a demolition order, and hardly a day goes by without the destruction of at least one Bedouin home somewhere in the Negev. Some villages such as Al-Araqib, just a few miles north of Beer Sheva and slated to become a Jewish National Fund forest, have been completely razed by the government (and rebuilt by activists, many of them Jewish) dozens of times. These demolitions have become highly charged, capturing media attention and leading to demonstrations—some of them violent. Umm al-Hiran’s saga began in 1956, when the Israeli government forcibly resettled the al-Quian tribe here after evicting it from its traditional lands in the northern Negev to make room for a kibbutz. The tribe members built houses and settled in, but the government never made the village legal, by leasing the land to the tribe or by providing municipal services such as running water, sewers or electricity. Although there were occasional demolitions, the villagers lived for decades in a relatively stable state of limbo. But in 2002, whatever sense of security existed in Umm al-Hiran vanished. To encourage more Jews to move to the Negev, Ariel Sharon’s government approved the establishment of 14 new Israeli communities. Umm al-Hiran’s residents were horrified to learn that one of these communities, Hiran—a large, modern city of 2,500 households designed for young national-religious Jews—was to be built precisely where their village stood. The government offered to resettle the residents of Umm al-Hiran in Hura, the sprawling, legally sanctioned Bedouin town three miles away, but most refused. In 2013, the villagers, represented by Adalah, an Israeli-Palestinian legal rights group, petitioned Israel’s Supreme Court against their removal and the demolition of their homes. In May, in a controversial decision that made international headlines, the villagers’ petition was rejected by a 2-1 decision. The Court agreed that the villagers were not trespassers, since the state itself had set them up on the land, and it criticized the government for the way it had handled the villagers’ case, and for presenting the residents as trespassers and squatters. Yet the majority ruled that since the land had never been leased to the villagers, there was nothing to prevent the state from evacuating them. In her minority opinion, one justice wrote that they should be permitted to stay and be provided with basic services. On the basis of that minority opinion and the recognition that they are not trespassers, the villagers intend to appeal to a larger panel of the Court. “If we are quiet on Umm al-Hiran, they can evacuate any village,” says Hassan Jabareen, Adalah’s chief attorney. And so Riad and his neighbors in Umm al-Hiran have become a new nexus in an already fraught relationship between the Bedouin—who are fighting to maintain their way of life—and the State of Israel, a modern nation that wants to develop its least-populated region and fears expanded Bedouin settlement. The context, says Clinton Bailey, widely regarded as one of Israel’s foremost experts on Bedouin culture, history and politics, “is the complete lack of goodwill on the part of the state toward the Bedouins, the lack of flexibility on the part of the Bedouins toward the state, missed opportunities, and changes in the Bedouin community as it is pulled between modernity and tradition. While the Negev has long beckoned to the Jewish imagination as a Zionist frontier, in reality it has languished compared to other parts of Israel. Until recently, the region was made up of a few cities, such as Beer Sheva, Dimona and Arad (poor, neglected development towns largely settled by immigrants from Arab-speaking countries in the 1950s); and several dozen economically sound kibbutzim and less economically sound moshavim [cooperative communities]. But this has changed in recent years. Multi-lane highways and modern railroads now link the Negev to the country’s center. Beer Sheva has grown into a vibrant city of nearly 200,000 residents as its university, medical facilities and high-tech ventures attract young, urban Israelis. The Negev’s open spaces are drawing in a new breed of self-styled pioneers who are setting up small farms, vineyards and cottage industries. At the same time, the military is transferring a major part of its operations to the Negev, including its key technology and intelligence facilities, which will spur further development. Until the State of Israel was founded, the Negev was mostly the domain of the Bedouin—the semi-nomadic desert inhabitants who lived in tents and depended on herds of camels and sheep, as well as subsistence farming, for their livelihood. A small number lived in scattered tumbledown villages or in Beer Sheva. After statehood, most fled or were expelled, primarily to Gaza, the Sinai Peninsula and Jordan. Some 90,000 Bedouin remained, consisting of three major tribes and about 95 subtribes. Following through on Dayan’s widely shared belief that it was necessary to change the Bedouin way of life, the state instituted a process of urbanization. Between 1968 and 1989, Israel built seven urban townships for them, promising government services and benefits. Within a few years, half of the Bedouin population moved into these communities, which included the Bedouin cities of Rahat, founded in 1971, now with around 55,000 residents, and Hura (population: 20,000), founded in 1989. The most intractable problem in these towns is poverty. Often located just a few miles from wealthy Jewish communities, Bedouin towns are Israel’s poorest and suffer from rampant joblessness, crime and violence. To some extent, Hura is an exception, thanks in no small part to its activist mayor, Muhammad al-Nabari. In Hura, the roads are paved, the traffic lights work, and there are small public parks with landscaping. Even so, Hura has one of Israel’s highest unemployment rates. By the early 2000s, the Israeli government realized that the situation was untenable. In 2007, the Goldberg Commission, chaired by former Supreme Court judge Eliezer Goldberg, was created. Its 2008 report concluded that “Israel must change the legal status of at least 46 villages so as to prevent perpetuation of the community’s unbearable state.” It suggested that a committee be set up to hear and settle Bedouin claims relating to traditional land ownership. The report was praised by many nonprofits and civil rights groups, but its suggestions were rejected by the Regional Council of Unrecognized Villages of the Negev, an ad hoc advocacy group. The Council maintained that the recommendations did not recognize Arab ownership of their land in the Negev, did not offer any just solution and continued to view the Bedouin primarily as a threat to the Jewish majority. The Goldberg Plan was never implemented, and in 2011, the government established the Prawer Commission, headed by Ehud Prawer, then head of policy planning in Prime Minister Benjamin Netanyahu’s office. In its recommendations, released the same year, the Prawer Commission called for some compensation to those Bedouin who resettled and an allocation of $300 million toward economic growth in the Bedouin community. The plan encountered objections from all sides. Many Bedouin leaders declared it undemocratic and racist. Israeli and international organizations condemned it as a violation of the Bedouins’ civil and human rights. From the other side of the political spectrum, right-wing politicians and groups like Regavim, which gives legal support to settlements and outposts in the West Bank, argued that there was no basis for recognizing Bedouin ownership of any Negev land. In December 2013, the Prawer Plan was scrapped. As the thick night covers Umm al-Hiran, men are called to prayer at the small shabbily constructed mosque, halfway down the hill. (A banner that declares “Say No to the Prawer Plan” in Arabic, Hebrew and English hangs upside-down on its fence.) Riad goes, not to pray, but to greet the worshippers, using a flashlight to find his way in the dark. The lights of Hura burn brightly to the east. At 5:30 a.m., Riad’s wife Maryam is up, preparing to bathe herself and the children. Because the water is pumped in from local wells or piped in through a single pipe stretching across the rocky terrain from Hura, there is no water pressure and no way to bring hot water indoors. Maryam fills huge metal pots and heats them on the stove, then carries them to the bathroom, where she washes the children, then herself, in plastic tubs. The toilet is “flushed” by sloshing water into the bowl. Maryam emerges, dressed in a traditional full-length, deep-purple coat-dress, her hair carefully covered by a matching floral scarf. Riad has bought a car for her, and she will drop the baby off at a relative’s and her older daughter at preschool on her way to teach at an elementary school in Hura. At 7 a.m. the sun, still low, is already beginning to burn, and Riad’s father, Salim Abu-Quian, takes me on a tour. A trader, Salim is Umm al-Hiran’s unofficial spokesman. We trudge up the hill to the main road, where the children from Umm al-Hiran catch buses and mini-vans to their schools in Hura. To get to the road, they have to walk down into the gully and then up the hill, schoolbags slung on their backs. I ask him why he has rejected the government’s offer to resettle in Hura. “Some people from our tribe did settle with the government and moved there a long time ago,” he says. “But not us. We are in a bitter conflict with those people, and if we move to Hura, there will be blood.” He refuses to say more about the conflict. Media reports refer vaguely to murders and revenge killings, still practiced among the tribes. “And anyway,” he adds, “there’s no room in Hura for us.” Later, an official of the Hura municipality, speaking on condition of anonymity, confirms this: There is no available housing in the village, and there is competition for each and every plot of land that opens up. “It’s not a viable idea,” he says. And if it comes down to it, if the government does insist on forcibly evicting them from Umm al-Hiran, will they resist? Will there be violence? “I hope not,” he says curtly. The anger over demolitions in unrecognized communities and the impoverished conditions in most of the recognized towns are dramatically changing Bedouin attitudes toward Israel. In the first decades after the establishment of Israel, Israeli officials considered the Bedouin apolitical. Unlike other Arab groups, Bedouin men regularly volunteered for the military, where they served in all-Bedouin combat and reconnaissance battalions. Other Bedouins—educated young adults with strong social and political awareness—are also disillusioned, and are encouraging their own society to emerge from its traditional, tribally oriented conservatism while challenging the State of Israel to recognize their national and cultural rights. For them, the unrecognized villages have become a symbol of resistance to the Israeli authorities, a call for solidarity in the Arab struggle for equality and a source of heightened Palestinian nationalist identity, all of which have galvanized them into political activity. Elobra speaks fluent Arabic, Hebrew and English, and like many young people he is more interested in issues than loyalty to the tribal system. He chooses to be interviewed in a trendy coffee shop in Jerusalem, where he lives. “My culture is Bedouin, my narrative is Palestinian, and my civilization is Arab. And I live in the State of Israel and hope to create a shared society with Israeli Jews,” he says. “Because our society was not literate, our part in the Naqba was never recorded,” he continues. In using the Arabic term Naqba (“the catastrophe”), for the period that Israeli Jews refer to as the War of Independence, he reveals a Palestinian political sensibility. “My family was expelled, too, and I have relatives in Jordan and in Gaza,” he says. This identification has led them to occasional violent political activism. In January, one man died and another was seriously injured in clashes with police as thousands attended a funeral for a man killed by the police the previous week, also at a demonstration. Some two dozen people were hurt at the January demonstration when the police used riot dispersal means because the event, the police spokesman said, had turned violent. Israeli-Palestinian politicians are taking note. In late March, just after the elections, a group of young leaders— Elobra prominent among them—organized a four-day “Awakening March” from the unrecognized village of Wadi al-Naam in the Negev to Jerusalem. Its goal was to bring attention to the plight of the unrecognized villages and it was led by Knesset member Ayman Odeh, who is not a Bedouin but head of the Arab Joint List party, which is now the third-largest party in the Knesset. In Jerusalem, Odeh announced, “Recognition of the unrecognized villages will improve life for all of the residents of the Negev, Jews and Arabs alike.” The destination was the presidential mansion where marchers were met by Israeli President Reuven Rivlin’s wife, Nechama, since the president was abroad. But the president’s office never released a formal statement, and even if it had, it would not have made much difference: The position of president in Israel is largely ceremonial. Future residents of Hiran, currently numbering several dozen families, are living some three miles to the east, in a temporary settlement, which has all the necessary utilities and services. The road to the site is well maintained, and the pathways are paved and planted with bougainvillea and flowers, watered by drip irrigation. A guard at the gate refuses me entrance into the settlement, and a spokesman for Hiran does not respond to inquiries. But at a gas station a mile or so down the road, a young man identifies himself as a resident of Hiran. He says that the residents “are not allowed to speak to the press”—but does not say who has forbidden them. He introduces himself as David but explains immediately that it’s not his real name. To paraphrase, the Jews are not only responsible for saving the Jews from Arab persecution, they are to blame for the Arab failure to save their fellow Arabs from Jewish persecution. To paraphrase: when a country claims to treat its citizens equally, it should do so. Whether Israel, the US, or anywhere else. Or do you think a Jewish state is a success if other countries have to “save their fellow” human beings from Jews? When those “fellow” human beings abiding the laws of the state, there is no need to “save” them. The State of Israel is surrounded on all sides by peoples wishing it harm and destruction. In spite of this ongoing state of perpetual war against it, the country strives to maintain and perpetuate a democracy based on equal rights for the tremendous diversity of all its citizens. Sometimes it works and some times it doesn’t, and most of the times it isn’t pretty. It never achieves the lofty standards demanded by its harshes critics in places like Norway or Spain. But even so the Jewish state strides on and is a remarkable work in progress. With almost no natural resources they have built a vibrant, modern 21st century model of a country, that although short of perfection, is nevertheless deserving of far more respect than is demonstrated by the cacophony of vitriol by its many, many critics.This reader is overwhelmed by the sheer hypocrisy of the hatred of the world’s oldest people, the Jews.